Premek Hi Tech now has 4 persons exclusively engaged in the service of Quality Assurance. 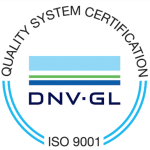 Already in 1997 Premek Hi Tech has obtained the Quality Certification ISO 9002, with the certification unit DNV (Det Norske Veritas), then upgraded to ISO 9001: 2008. The company also owns the Quality Certification ADW2 – ADW6 / 2 with TÜV and is in the process of implementation of new certifications. For Premek Hi Tech Quality is still much more of a flag to wave, it is rather a style and a way of being: everything starts from Quality. Everything has to end with that quality which should be ensured to the customer, pursued at every stage of the production cycle, became an integral part of the corporate system, subject to more stringent checks before placing the product in the market.